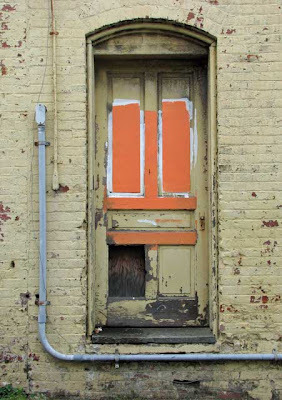 Of a photo of the alley door to the Golden West! My walking buddy "Short Legs" e-mailed that there was some new paint on the door so this morning I took a look and a photo. I think the conduit is new..., too. My "birthday walk" starts in less than a week. Last year I walked 6.6 miles on my 66th birthday. This year my goal is to walk 67 miles for my 67th birthday. Of course there is no way I can walk 67 miles on my birthday but I'm thinking 6.7 miles a day for ten days could work! My plan is to start the first day of April and finish on my birthday, April 10th. It would be easiest to just walk out the haul road and back each day but rather boring. 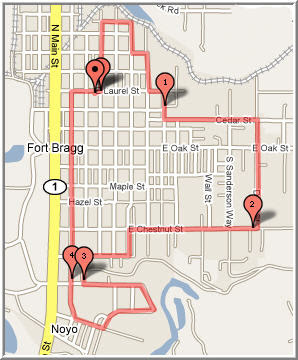 This morning I did a trial walk following some of the perimeter of Fort Bragg just to see how many miles it would add up to. My walk ended up being 5.29 miles. By adding some of the western border of town I can easily increase it to 6.7. Some fine tuning will be required but this route would break up the boredom!! Hey! Someone really said it! Check out "Beating the Bounds" post "Wanderlust".